Matheus Rocha Pitta, First stone, 2015-2016. Concrete cubes, newspapers and stone, variable dimensions. Artist Matheus Rocha Pitta, born in Minas Gerais, presents the interactive installation Primeira pedra [First Stone] (2015-2016), offered as a donation to the museum by the artist himself and by the art gallery that represents him. 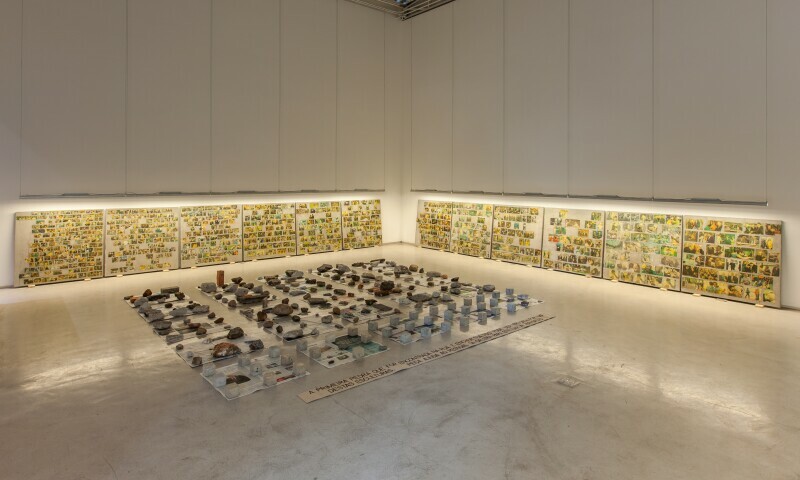 The work is composed of concrete cubes that can easily be picked up and held in the palm of a hand, which have been placed on top of pages of the previous day’s issue of the local newspaper. The cubes are offered to the public in exchange not for money, but for another stone: to possess one, the visitor must exit the museum and bring back the first stone they find out in the street. The work radicalizes the concept of multiples to its extreme, whereby each piece can be taken home by the visitor as a work of art, thus affirming the link between the museum and the city through the gesture of each individual.